This first video is Dorie talking about her relationship with her mother, who (surprisingly) rarely ever cooked/baked for her! 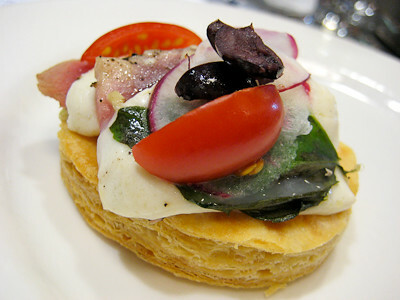 Next, you'll see Dorie telling a funny story about what she learned about cheese when she was in Paris. Then someone in the audience asked Dorie if she was done writing cookbooks, or if there would be another one in the future and you can see what Dorie says about that here. She's actually going to go hang out with all of her baking idols and then write a book full of recipes based on what she learns from each of them - how cool is that? 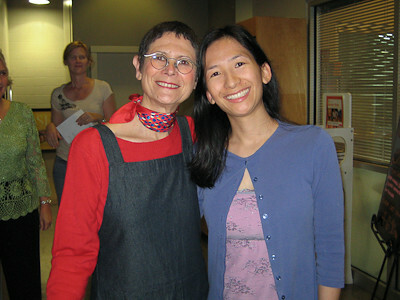 Not only was I lucky enough to meet Dorie, but I was able to do so on her birthday! 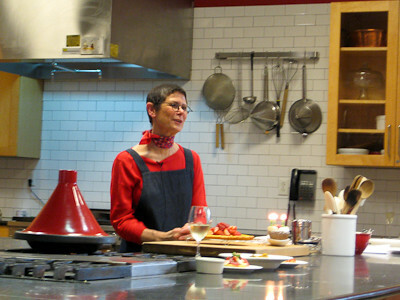 At the end of the cooking class, the Central Market staff presented Dorie with a birthday cupcake and we all sang "Happy Birthday" to her - see her reaction here - she is too cute! Now on to the cooking class itself. Dorie made a few different dishes for us from her book. She said that she wants to make cooking simple and easy and I think she has definitely accomplished that with her book. While at first glance, some of the recipes from this book may look a bit involved, there wasn't really anything that she made for us that day that I felt would be too difficult or time consuming for me (and I am much more of a baker than a cook!). I feel like a lot of today's quick dinner ideas involve a lot of prepackaged or processed foods - Dorie's book allows the home cook to make simple dinners that taste like they took hours to prepare. 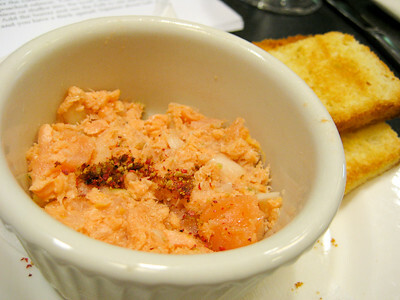 Salmon Rillettes - I've never tried smoked salmon before. I've never wanted to. I know smoked salmon is "cooked" but I've always felt like it was still raw and could not bring myself to try it. But here I was, with a recipe that Dorie had created and I thought I'd better try it because if Dorie loves it, it has to be good, right? So I was brave and tried a bite... and then another bite... and then another until my little ramekin was empty! I think because the smoked salmon was mixed up with the chunks of poached salmon, I wasn't really able to recognize the texture of the smoked salmon. The hint of lemon with the salmon in this appetizer was fabulous and I could totally see myself making this in the future for dinner guests because it's something you could easily make in advance. Fresh Tuna, Mozzarella & Basil Pizza - This was delicious, even without the tuna. I don't generally eat sushi, but I wanted to taste this "pizza" as Dorie intended so I tried a bite with the tuna, and then had the rest sans tuna. I'm usually not a very adventurous eater, but again, I had to give it a try because it was Dorie's creation. 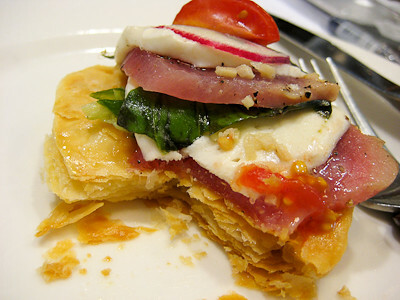 Look at all those wonderful layers of puff pastry! 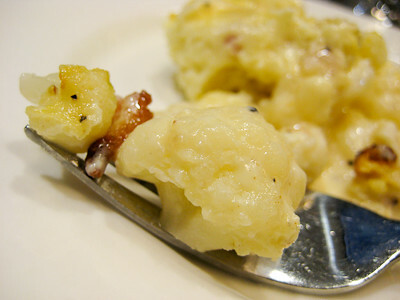 Cauliflower-Bacon Gratin - Creamy goodness! And it has to be healthy because cauliflower is the main ingredient, right? ;) This is better than any green bean casserole and will definitely be served for Thanksgiving at our house this year! 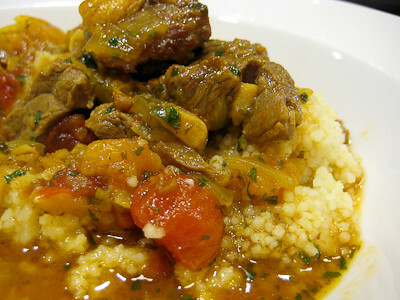 Lamb & Dried Apricot Tagine - Another first for me. Not my first time trying lamb, but my first time actually enjoying it! The lamb I've previously tasted was always gamey and had a funny taste to it. This lamb was tender and moist and I would not have known it was lamb unless you told me it was. The apricots imparted a sweet and delicious flavor to this dish that complemented the spices very well. I was glad to find out that this dish can be made in a dutch oven, as I do not have a tagine. Sable Breton Galette with Berries - Simple and elegant. 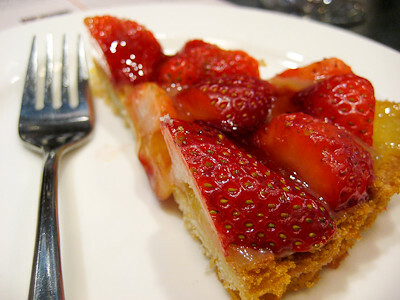 Strawberries atop a layer of lemon curd that has been spread across a buttery, cookie crust. Yum. Neither the salmon rillettes nor the lamb tagine would be dishes that I would ever make on my own from the book. Yet I thoroughly enjoyed them and plan to make them in the future. 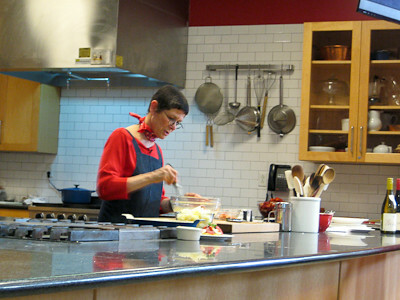 So, while 9 times out of 10 you'll find me baking instead of cooking in the kitchen, I look forward to participating in French Fridays with Dorie because it will push me to try recipes I wouldn't otherwise try, and to develop my cooking skills in the kitchen. My participation in that group will be intermittent at best, as I already have a lot on my plate, but I look forward to cooking along whenever possible with the group. Along with getting to meet Dorie, I had the pleasure of meeting Jessica of My Baking Heart, Paula of Salad in a Jar, and Amy of Sing for Your Supper. 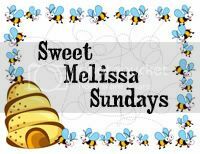 Hop on over to their blogs, as they got some great photos (better images than the ones I was able to get with my point-and-shoot camera) from that day to share, too. Thanks, Dorie, for a wonderful and memorable day. I know it must have been difficult for you to be away from home, family, and friends on your birthday but I am so grateful that I had the pleasure of spending those few hours with you! I look forward to the release of your next cookbook, and have already set aside a special spot for it on my shelf! What a wonderful post Jaime! How cool is that! You got to meet Dorie! I have read a lot of other post on blogs where people are meeting her! She seems like sucha real donw to earth lady! I love the video clips, thanks for sharing your fun experience with us!! Great post Jaime! It sounds like an absolutely perfect day with Dorie. I can't wait to check out your videos when I get a chance - great idea to shoot a few clips. That's so cool! Great post Jaime! Wow! Great review of the day, Jaime. Interesting to hear your take on the food. Your pictures of the food turned out really good I think. Yay for meeting Dorie! Around my French Table is definitely on my Christmas list this year. ha--i love her neckerchief. :) how cool that you got to experience this--i'm glad you soaked it all up! That is SO cool that you not only meet her but got to watch her in action! Thanks for sharing. I'm gonna check out your videos. What a post...right from the heart Jaime. This is just how I expected Dorie to be...warm, exciting and fun! There is something infectious and happening about this post...I do love it! Fantastic post, Jaime! Wish she had made it down here to Houston!! The pics still turned out great, even without your DSLR--what a wonderful experience for you!! !